Ignatius Baffour Awuah, Minister of Employment and Labour Relations has cut the sod for the construction of the Ghanaian-German Centre for Jobs, Migration and Reintegration (GCC) in Accra. Mr. Awuah who officially cut the sod said the $500,000 project was being financed by the German Federal Ministry of Economic Cooperation and Development as the Deutsche Gesellschaft fur Internationale Zusammenarbeit (GIZ) in collaboration with MELR. The centre, which boost of a conference hall, consultancy room, administrative block, central courtyard, offices and land scaping, would provide and collect data, information, as well as offer training and employment opportunities. After completion, it would provide advisory services to migrants, promote regular migration and support voluntary returnees in social and economic reintegration. 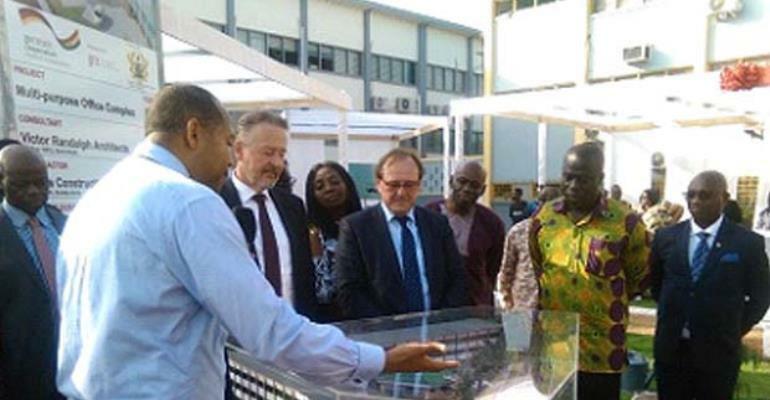 According to the minister, the facility would further fortify Ghana's labour and migration issues, as well as offer a conducive environment for effective regulation and monitoring. Mr. Baffuor Awuah said the illegal activities in migration open people to abuse and vulnerable situations, hence the need to improve their living conditions. Mr Awuah said the Ghana-German partnership would, among others, help revamp public employment sectors to facilitate job creation and coordinate labour migration challenges at the district and national levels. He appealed to GIZ to help establish more of such facilities in all regions. Dr Stefan Oswald, Director General of GIZ, on his part, assured the Minister of Germany's commitment to support the country's development strategies of tackling unemployment, saying the venture would deepen the relationship between the two countries. Commenting on certain achievements, he said GIZ, together with its development partners, had counseled about 14,400 people, employed 200 people and supported more than 400 people to start their own businesses. The sod-cutting ceremony for the Agbogbloshie recycling plant also took place Wednesday. The Environmentally Sound Disposal and Recycling of e-Waste module is being implemented by Deutsche Gesellschaft für Internationale Zusammenarbeit (GIZ) GmbH, in partnership with the Ministry of Environment, Science, Technology and Innovation (MESTI).